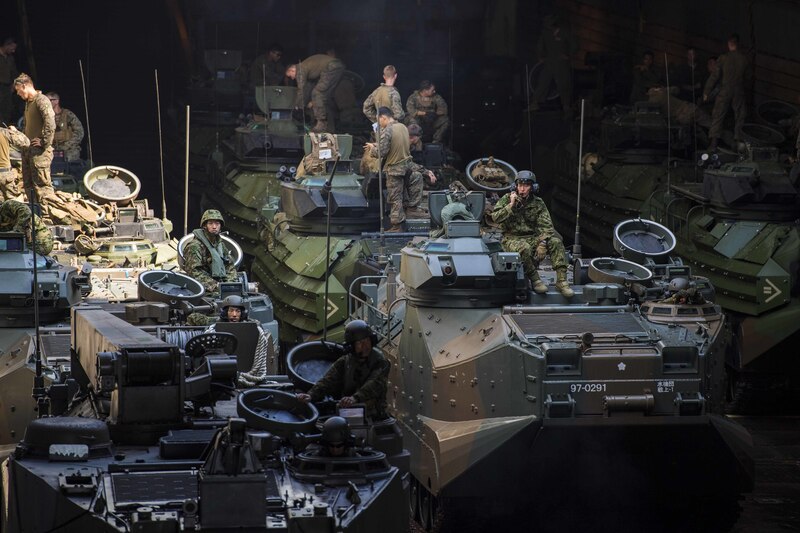 It was no ordinary beach assault when troops took off on amphibious assault vehicles from a U.S. Navy ship and raced ashore in a training exercise with U.S. Marines. That’s because the landing onto a Philippine beach by Japanese soldiers from their AAV-P7/A1 amtracs marked a significant step in bolstering Japan’s capabilities of its nascent Amphibious Rapid Deployment Brigade. The amphibious unit, comprised of soldiers with Japan’s Ground Self Defense Force, joined with Marines of the 31st Marine Expeditionary Unit aboard dock landing ship USS Ashland (LSD-48) for the training alongside Philippine military forces during the bilateral exercise Kamandag, or “Kaagapay Ng Mga Mandirigma Ng Dagat,” along the Philippine Sea northwest of Manila. The 10-day exercise between the U.S. and Philippines kicked off Oct. 2 and is focused on humanitarian and disaster response, amphibious operations and counter-terrorism training. The exercise also includes members of 7th Fleet, 3rd Marine Expeditionary Brigade, along with the Philippine Marine Corps, Philippine Navy and Philippine Air Force. Japan doesn’t allow its defense forces to participate in offensive, combat type training, although the prime minister has supported revising its policy and pacific constitution. 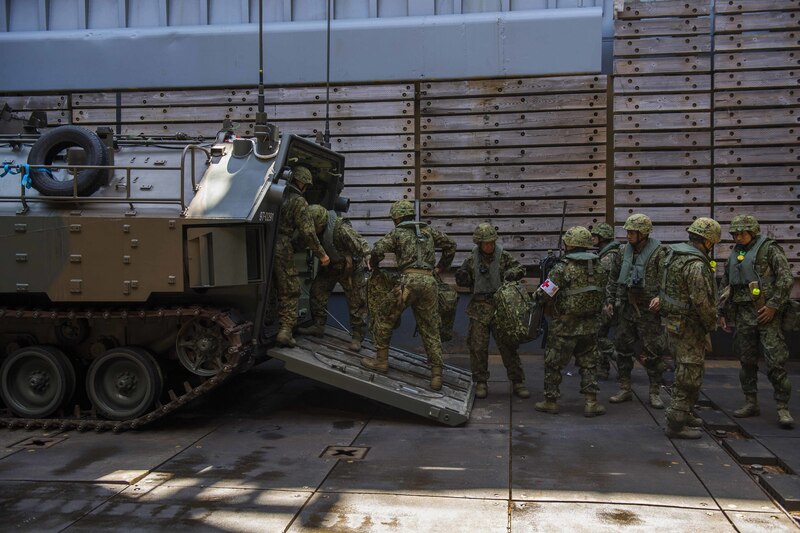 The ARDB formed in March under the JGSDF’s Western Army with a mission of rapid deployment for contingencies, including potential threats to and attacks against Japan’s many remote islands. “Security units will be positioned on Amami Oshima, Miyako Island and Ishigaki Island,” according to an Aug. 27 Japan Ministry of Defense overview on Japan’s security environment in the Asia-Pacific region. Those are islands southwest and northwest of Okinawa in the Ryukyu Islands chain that stretches between the Pacific and the East China Sea. The amphibious landing also marked the first time that Japan has operated its current, small fleet of AAVs in a foreign country. (ARDB soldiers trained with Marine Corps amtracs during training earlier this year at Camp Pendleton, Calif.) Japan is growing its fleet with the new AAV-P7/A1 through a 2016 contract with manufacturer BAE Systems for 30 vehicles. No ship with Japan’s Maritime Self Defense Force joined in Kamandag, but a commercial ship hauled the AAVs to the region for the exercise. 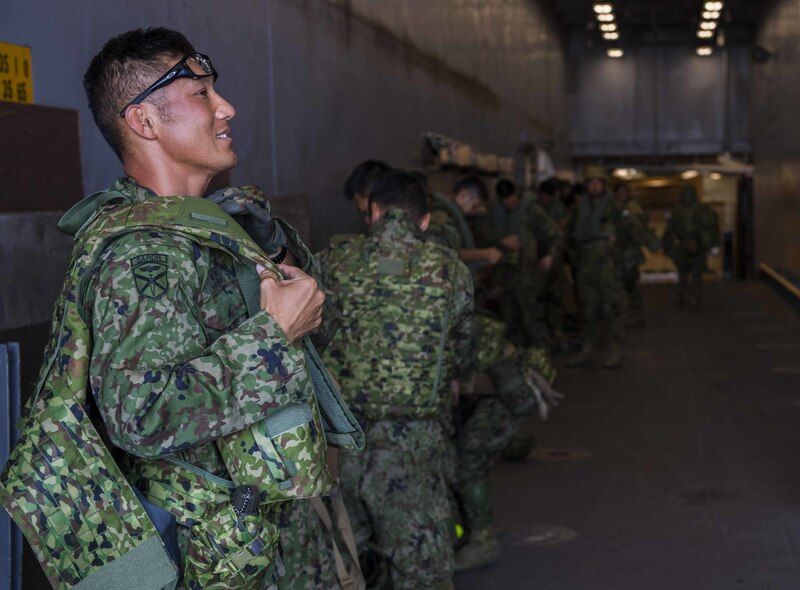 The presence of a small force of JGSDF’s “sea soldiers” along with Japan and 31st MEU’s AAVs provided an interesting third wheel during the bilateral training designed to improve interoperability and strengthen partnerships among the forces. The Philippine Navy and its Philippine Marine Ready Force also are adopting the amtracs. The Philippine landing platform dock ship BRP Davao del Sur (LD-6002) joined Ashland for the exercise. 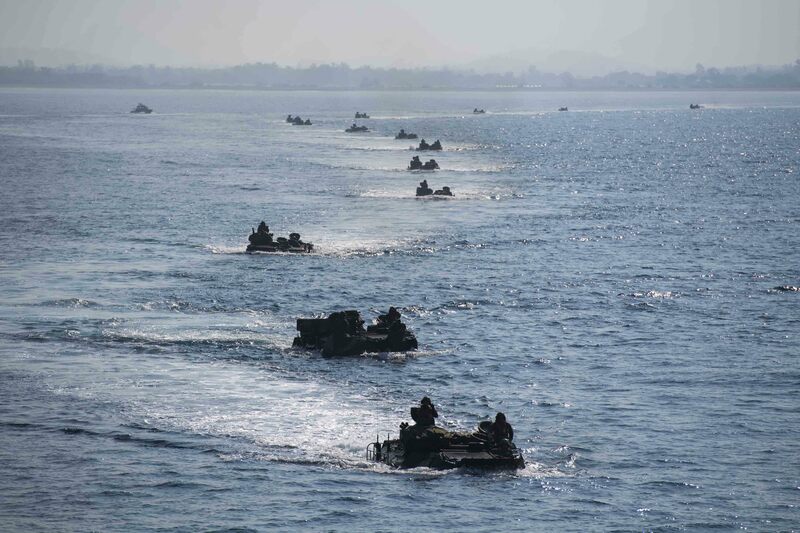 “This is another step forward in working alongside the Philippine Marine Corps and the Philippine Navy as they advance their amphibious capability,” Lt. Col. Michael K. Chankij, the lead U.S. exercise planner, said in the Marine Corps news story, noting the exercise follows AAV shipboard and amphibious assault training held last year with the Philippine Navy’s BRP Tarlac (LD-601). “Training with U.S. Marines and the JGSDF is crucial in fostering camaraderie, friendship and the exchange of ideas,” Espinosa said, adding the Filipino force expects to use their own, new AAVs for the next iteration of Kamandag in 2019. 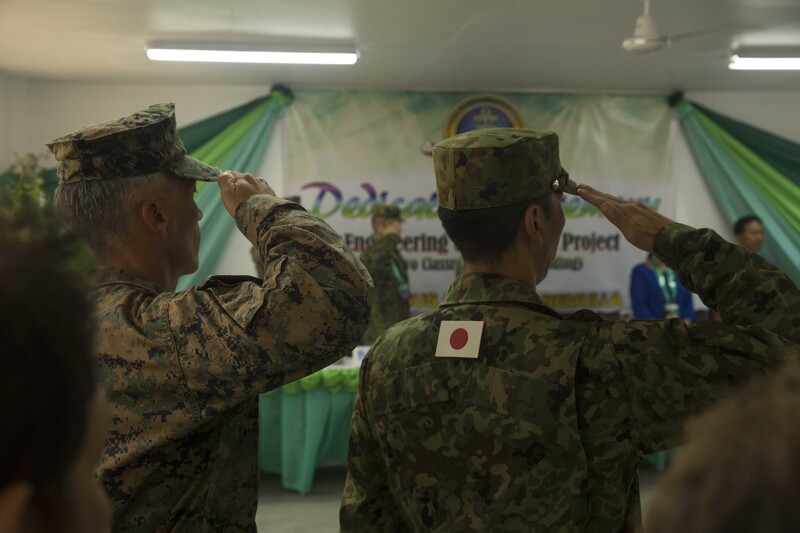 Japan ARDB’s training with U.S. and Philippine forces – and in the Philippines – is seen as a big step toward greater participation by Japan forces with other allies and partners in the region. The exercise is another critical step toward building the ARDB as a capable, credible force, Newsham said. The ARDB “is just getting started so they naturally need a lot more work and practice. There’s also a need for the ARDB and MSDF to regularize their relationship,” much like the 31st MEU and 7th Fleet. That prospect is a reminder, too, that as the ARDB continues to hone its capabilities and build skills within the force, it needs to train with not just Japan’s maritime force but jointly, with more of the Ground Self Defense Force and, particularly, the Air Self Defense Force. But that’s been severely lacking, Newsham said.